The Children’s Book Bank of Toronto, Canada is a charitable organization designed to support children’s literacy by providing free books and literacy support to children in lower income neighbourhoods. We learned about it from our good friend and podcaster, Sage Tyrtle, in an email she sent us offering to help record an interview with founder Kim Beatty. We managed to convince her to do more than that. On this edition of Just One More Book! 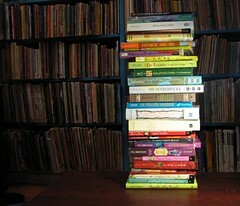 !, correspondent Sage Tyrtle of the QN Podcast introduces us to The Children’s Book Bank. By the way, Sage’s QN podcast is definitely for adults, not children, and frequently includes strong language and political views. Photo of Kim Beatty by Harry Gils. To close out 2008 with a bang, Just One More Book!! will publish its 500th episode on December 31. This means that we’ll be adjusting our release schedule over the next three weeks. Shows will be released on the 22nd, 24th, 26th and 31st. We will pick up our regular schedule on January 2, 2009. Not much impresses young listeners more than their reading adult opening up a book and belting out a song. 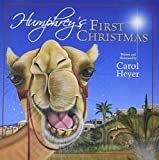 Add an action-packed story, a honky tonk narrator and engaging, humourous illustrations and this campfire standard will make you a storytime rock star. HOTLINE VOICES: Regular contributor Kevin Hodgson dares us with his descriptive thoughts on The Man Who Walked Between the Towers (by Mordicai Gerstein) and explains why this is the perfect book for the picture book genre. Leave a comment to tell us about your wintry favourites. You could say that Sheree Fitch became a part of our family long before we met her in 2006. Ahhh… the mark of a great author, that their books are so good that you wake up with them each morning, hang out with them all day and go to bed with them at night. That’s what made it so sad when we found out that a large portion of Sheree’s books were no longer in print. In November 2006, we spent a few hours with Sheree when she was in Ottawa. We talked about children’s books and our daughter Lucy read aloud the amazing book Sleeping Dragons All Around. We brought Mocha Maple Chocolate cupcakes as a treat. And so began our campaign to have Sleeping Dragons reprinted. On this edition of Just One More Book! !, author Sheree Fitch talks about the 20th anniversary edition of Sleeping Dragons All Around, being the author of a book that’s reaching a second generation and how Sleeping Dragons became and will always be a part of a family that suffered a tragic loss. This is the second in a two-part series about Sleeping Dragons All Around. In part one, we replayed our original review of Sleeping Dragons, complete with questionable recording quality. When we feel better about ourselves, we feel better about everything. Shadowy, Sendakian illustrations and spot-on, multiply paced rhyming text take us for one spin around the familiar first-born cycle of resentment, rage, worry, the relief of being understood, warm fuzziness and back to the joy of siblinghood in this reassuring glimpse inside a shared spotlight. HOTLINE VOICES: Author and teacher Laura Purdie Salas shares one of her favourite books, This is Just to Say: Poems of Apology and Forgiveness (by Joyce Sidman and Pamela Zagarenski). Friendly, conversational narrative and breezy humour-splashed illustrations take us from the book-triggered birth of the goat-giving idea, through brainstorming, planning, implementation, bookkeeping and celebration in this inspiring, true tale of fifth graders who decided to make a difference. You can learn more about books that help children see the power and possibility of relatively small, tangible gestures, by listening to (or reading) Andrea’s contribution to Vivian Vasquez’s CLIP Podcast, here. HOTLINE VOICES: Daniel Johnson Jr. (blog and podcast) and his daughter, Keisha, help make it a great day by sharing one of their favourite books, Judy Blume‘s Otherwise Known as Sheila the Great.